There are a few Dunkin' Donut (a big US chain that makes hot and fresh fried donut) in Barcelona. Besides of store, DD also opens tiny counter in subway. The DD stores that I have been, their donuts are delivered from somewhere instead of making at site. So I opt for home-made. This donut's dough requires no kneading nor frying :) :) The interior still turns out very light and spongy. But I would like to mind you, no alternative, even including this recipe, can imitate the texture of the fried donut, as that light-ness and fluffy-ness are ultimate!!! The recipe is from my very favorite cookbook - The Fannie Farmer's Cookbook, written by Marion Cunningham. The author suggests after the donuts coming out from oven, immediately dunking them in melted butter, then sprinkling cinnamon sugar to finish. I am sure they'd be splendid. But I would love to stay away from the extra fat; that's the reason why I 'bake'. 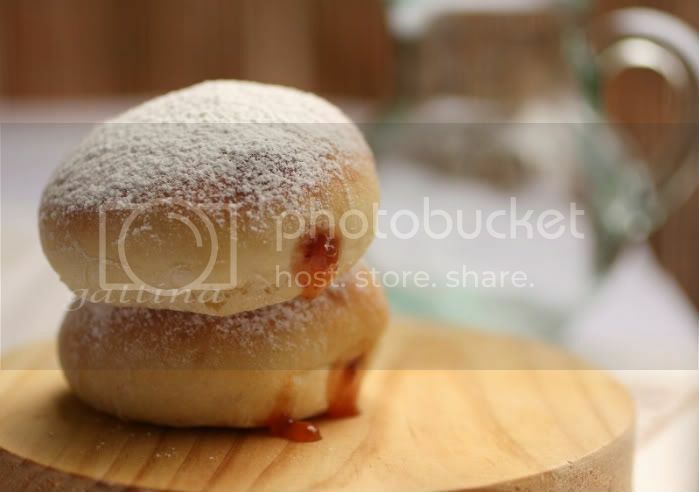 Therefore, I filled the donuts with low-sugar jam (custard sounds great too), and outside dusted with powder sugar. In a small bowl, mix the yeast, a pinch of sugar and 1/4 cup water. Sit for 5 minutes, and you should see some bubbles on top. In a large mixing bowl, combine the flour, salt and 1/4 cup sugar. Pour in the yeast mixture, melted butter, egg and the milk, use a mixing spoon and keep stirring until everything well-combines, for about 5 minutes. The consistency is super sticky, similar to cake batter's. Cover the bowl, let it proof in room temp of about 75F for an hour or so, the volume should be double. Since the dough is super-sticky, make sure the work table is well-floured, prepare a small bowl of flour aside for your hand/spatula. Carefully pour the dough on the table (with the help of spatula or hand.... everything dust with flour! ), it would spread out by itself since it's very soft and lumpy. Do NOT knead or pat it too hard (as it will "kill" the air bubbles, your donuts won't be that airy then). Gental pet the dough until the thickness reaches about 2 cm. Dip the cookie cutter (mine is 6cm in dia) with flour first and cut the dough, may use a spatula to help you transferring the round doughs onto a large baking tray. Pre-grease a large piece of plastic wrap, cover the doughs and rest for 20 minutes. After the first around of cut-out (those should fill up one tray), you still have quite a bit of dough left. Dust off the excessive flour, gently push them together (and a little folding job may need), pat it flat again, and do the second round of cut-out. These will be for the second tray, and which will go to the oven the second round (I don't recommend two trays together going into the oven) as these round doughs need more time to rest/ restore the bubbles. Pre-heat the oven to 400C. After send in the first tray in oven, may lower the temp to 375F if the bread browns too soon. The total baking time is only about 7 minutes, and have to take them out just before they turn brown (brown crust is too tough for donut). Then go bake the second tray. Cool the donuts on a rack. Fill them with jam, and dust the powder sugar outside. The baked donuts freeze well too. Just take them out from oven a minute or 2 earlier. Don't fill anything, after they completely cool off, wrap well and freeze. When you want them, let them thaw a bit, and reheat in a medium-hot oven for 1 - 2 minutes, and continue the jam and powder sugar. no kneading and no frying!! I am in. Looks perfect. They look gorgeous! This version is very ineteresting! Oooooh,...aaaaaaah,....oooooh,....what a stunning, divine & lovely endresult!! These look fabulous, dear gattina!! you are certainly the master in bread, donughts making!! Oooh,...yes! well, you are just mean this morning! :) I've been craving donuts for weeks but haven't let myself give in... they look so amazing! Thx for the tip. I'll try it out for sure. definetely have to mark this page!! 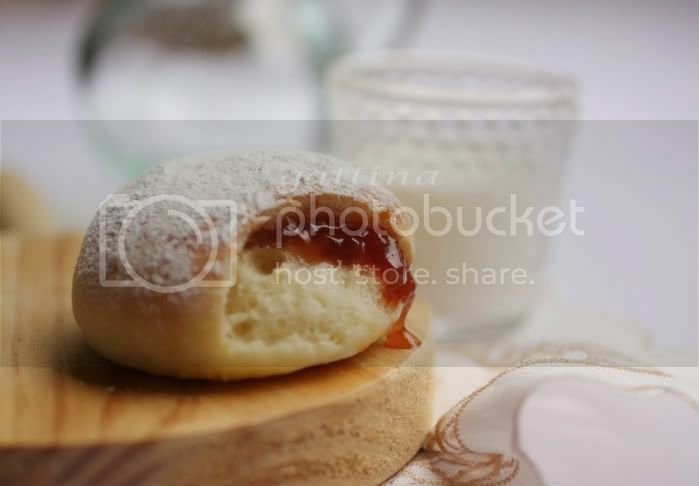 I've been searching the recipes of baking donat..this version is simple...thanks!!! Wow! They looks perfect! And the most important - no frying! Shows you it doesn't have to be fried! Looks just right for a doughnut! Count me in. very interesting recipe :) i am vegetarian and don't eat eggs. is there a substitute for egg? thanks. hi lotus root, I think the role of egg in this recipe is to enhance the flavor of the bread... if that doesn't matter with you, just skip the egg and increase spoonfuls of milk... or replace with yogurt or a very small potato (dry flaky type, cooked and meshed), but I haven't tasted them, help that helps. I love fried donuts but don't like frying so this sounds perfect! They look gorgeous too! Yummy donuts look heavenly, this recipe is perfect for me, no frying, I must try!!! ciao. Althoug I am more into muffins, those donuts look great and since I don't like frying at home, I certainly will try them out.